Before you try to run this version of mutt, please take the time to read the attached list of changes since 1.2 in order to avoid problems and frustration. Over the last (my god) one-and-a-half (or so) years, there were considerable contributions from Brendan Cully (who greatly improved mutt’s IMAP support), Edmund Grimley Evans (who told mutt about the iconv API for character set conversions, and taught it about utf-8 locales) and Vsevolod Volkov (who added POP mailbox support). All the others who were helpful with mutt are too numerous to mention – please take a look at the ChangeLog and at the credits section in the end of the manual for details. Thanks to all of you. If you find any bugs in this beta version of mutt (and I’m sure you will), please report them using flea (the program formerly known as muttbug). Oh, the download details: mutt-1.3.22 is available from here. PS: I forgot something from the NEWS file – you can now pass full-featured mailto URLs to mutt on the command line, including any subject, body specifications. ICANN‘s At-Large Membership Study Committeee has published a Final Draft on the ICANN At-Large membership (e-book version). Their suggestion is to create an At Large Supporting Organization (ALSO) which comprises individual domain name holders. The ALSO would be based on six (!) geographic regions, with six elected directors serving on the board. The five candidates with the next highest number of votes are suggested to form a regional at-large council. RFC 3156, MIME Security with OpenPGP, is finally out. This is the successor of RFC 2015, with the changes necessary to accomodate the OpenPGP changes. There are few changes which actually make modifications of implementations necessary – if you have a defensive implementation of the old PGP/MIME, you won’t have to change anything. Patrick Oonk has current Code Red stats on his site. Note that his Code Red II stats oscillate wildly, and are apparently strongly influenced by CR II’s locality properties. If you want to learn more about CR II’s overall growth, look at how the CR I plot decays. 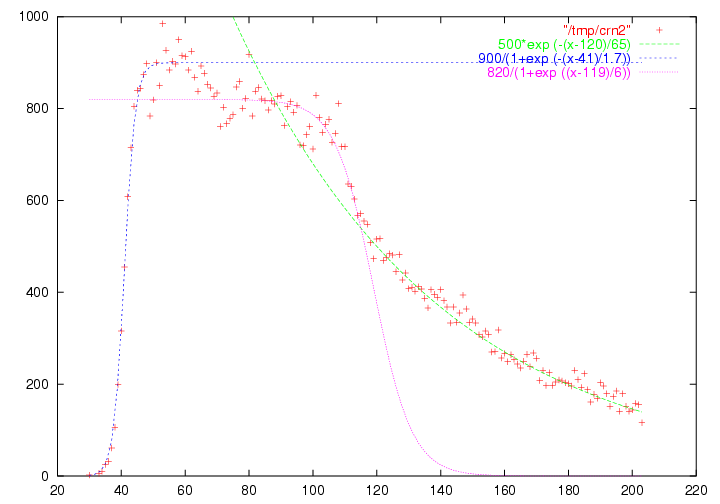 I’ve also done some curve fitting with one version of Patrick’s data. The result is available here. One should almost have expected it: There’s a more malicious version of Code Read out on the Network, and it seems to be taking over all the Windows 2000 hosts infected with Code Red. Information is here: incidents.org / Security Focus. Wau Holland was a regular participant in the discussions on FITUG‘s debate mailing list. The messages he sent were occasionally strange or bizarre, but most of them were also thought-provoking and interesting at the same time. They are certainly a part of his heritage, and should be preserved. You can download a collection of the messages he sent to that list here. It seems that the latest Code Red incident is saturated by now. Some statistics are available at incidents.org. Stuart Staniford has a model derived from the July outbreak (he shows that the growth of the worm is determined by the logistic differential equation – but note that he gives a derivation of this equation from basic assumptions), and has fitted this model into the latest numbers. Both sources indicate that about half as many hosts as last time were vulnerable.